Of course, cos he is so damn picky that it’s ridiculous. So we walk in circles until he picks sth for his royal palate to handle – yeah mostly potatoes and eggs 0_o and cheese… Bread is bleh, ham is bleh… so mostly I don’t eat lunches with him or rarely what he eats. This time I had to use a mix of lettuce I bought a couple days before – which Cookies OF COURSE doesn’t like cos it has an evil green called RUCOLA! Thankfully it was Saturday so I already went to the yard store for some lunch meat (cold meat, cold cuts) and I bought 4 nice pork ham hot dogs. In the yard store I always can find something interesting – cos they order from local producers, not only from the big companies like Olewnik or Sobsmak. I always ask the lady what she thinks is the best within certain products and since I’m always nice and smiling she answers honestly 0_o. This time she told me they got new hot dogs made from straight pork ham meat. I tried it and yes these are really good. I wanted the salad to also look nice and funny hence I made it look like little goaties that I remember from one New Years party. Just stir everything together thoroughly, add some olives to the marinate if too thick, just be careful with salt then, as this marinade is usually very salty. Cut hot dogs in 4 cm pieces, cut to the middle, then flip 180 degrees and cut the same way, it has to look like you want to cut it in 4 long pieces but in general as cross. You can boil it in water for few minutes until they “open” or on two drops of oil heat it up and brown a little. Toss lettuce on the plate. Cut tomato as you like, cut cucumbers as you like – place it on top of the lettuce. 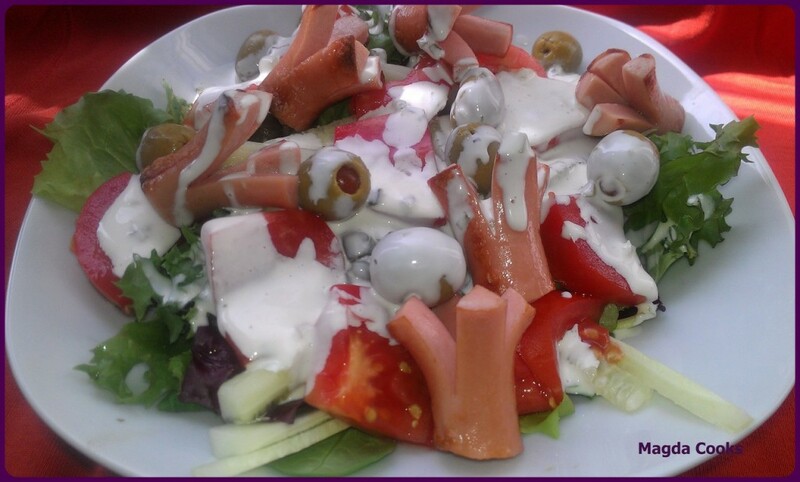 Place goaties on top, over it some olives and sprinkle with dressing.